Rodger’s Plumbing is a family owned and operated plumbing company in Dallas, Texas with a staff of certified plumbers who specialize in water heater repair and replacement plumbing services. Rodger’s Plumbing has been specializing in water heater replacement and repair plumbing services since 1970. Our years of plumbing experience and the use of quality water heater products has kept our valued customers in Dallas, Texas returning for all of their plumbing repair and installation needs. With over 45 years of plumbing experience our plumbers have had the opportunity to deal with water heater problems in Dallas, Texas. Water heaters come in many sizes and many energy source options along with various warranties. Rodger’s Plumbing stocks many sizes of commercial gas, electric and residential water heaters. The 40 gallon and 50 gallon gas and electric water heaters are the most common water heaters that Rodger’s Plumbing installs for residential use in Dallas, Texas. Our plumbers can guide the customer to help them select the appropriate size of the water heater. There are a variety of sizes regarding commercial water heaters. Call our plumbing company and we will determine the commercial water heater tank suited best for your business. Your water heater is out of sight in your home and a majority of us don’t think about it until it stops working properly. Take a little time to give you water heater tank its annual maintenance the manufactures recommend. If you are having water heater problems, Rodger’s Plumbing is available to access your water heater. 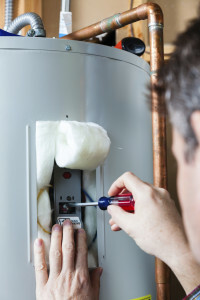 Our plumbers have the skills and expertise to diagnose, repair, replace, and install your water heater. You don’t have to put up with cold water anymore! Our Plumbers have the answer to everything related to water heater installation and repair in Dallas, Texas including the following towns of University Park, Highland Park, Coppell, Farmers Branch, Addison, Carrollton, Plano, Richardson, North Dallas, Allen, Garland, Sachse, Wylie, Murphy, Rowlett, North Mesquite, North Irving, Mckinney, Hebron, and Frisco.